Vietnamese Coconut Herbal Chicken Soup (Ga Ham Thuoc Bac Nuoc Dua) is not only delicious, but it can also warm and heal your body. It will provide you with energy to fight off illnesses in colder months. 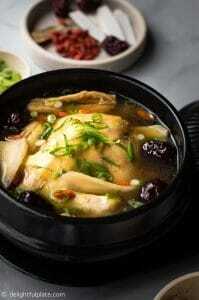 Herbal Chicken Soup is one of my go-to dishes when I don’t feel well, especially in winter. 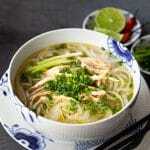 In Vietnam, chicken soup is often considered light and easy on the stomach, while herbal medicines are believed to have healing properties. With the right amounts, Chinese herbal medicines can help to restore energy by balancing the opposing forces of energy in our body – yin and yang. Simmering chicken with herbal medicines results in a nourishing and healthy soup which is also easy to absorb by the body. 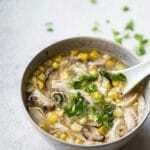 The soup has the lightness of chicken broth, some bitterness from herbal medicines and light sweetness from coconut juice. Very well-balanced in flavors in my opinion. There are also other Vietnamese herbal chicken soup versions that don’t use coconut juice, but I think adding fresh coconut juice really balances and rounds out the flavors. The chicken meat will be very tender by the time we finish slow-simmering the soup. 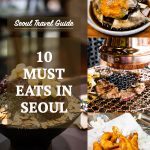 You can eat the soup on its own, with rice or with noodles. 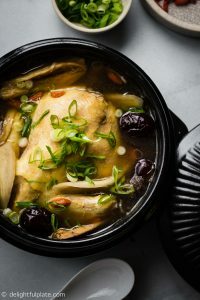 The main ingredients for this Vietnamese herbal chicken soup is chicken, fresh young coconut juice and Chinese herbal medicines. Small chicken like cornish hens (about 1.5 – 1.75 lbs each) and silkie chicken are traditional choices. Regular chicken or chicken parts with bones will also work if you cannot find cornish hens or silkie chicken. angelica sinensis (đương quy): a warming herb, which is said to help with blood circulation. It has a quite strong and distinct herbal fragrance. You need to use juice from a fresh coconut. Do not use packaged/canned coconut water. You can buy the herbs above at Asian grocery stores or on Amazon (for example, goji berries). Asian grocery stores often sell packages of individual herbs or packages of mixed herbs for herbal soup. I came across Root and Spring, an online store selling packaged herbal mix, and they have quite a lot of positive reviews. 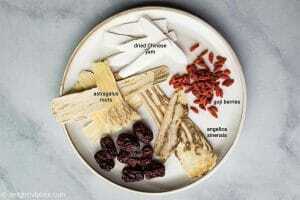 You may want to check out Root and Spring herbal soup mix. Regardless of where you buy the medicinal herbs, rinse them to get rid of dust and dirt. 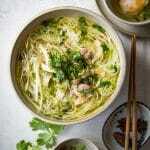 Cooking Vietnamese herbal chicken soup is easy. 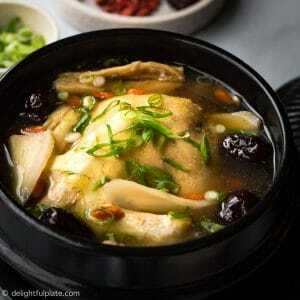 All ingredients will be slow-simmered in one pot to desired strength of the soup or tenderness of the chicken. The longer you simmer, the darker the soup will be and the medicinal herbal flavors will also be stronger. For a cornish hen, simmering for about 45 minutes is perfect for me. You may want to taste the soup throughout the cooking process and stop when you’re happy with the flavors. You can also tweak the ratio of coconut juice and plain water depending on how sweet and how much coconut flavor you like. I like 1-2 parts of coconut juice to 1 part of water. I like to serve the whole cornish hen with soup in a bowl, and then pick out the meat when eating. If you use a regular larger chicken, you can shred the meat before serving. Vietnamese Coconut Herbal Chicken Soup (Ga Ham Thuoc Bac Nuoc Dua) is not only delicious, but it can also warm and heal your body. It will provide you with energy to fight off illnesses in colder months. An easy one-pot recipe with health benefits. Rinse all herbs (astragalus roots, dried Chinese yams, angelica sinensis, goji berries and red dates) under water to remove dirt. Drain and set aside. Rub cornish hen with a lot of salt and rinse under water to clean it. Or you can parboil it in boiling water for 1-2 minutes. In a clean pot, add cornish hen, ginger, garlic, coconut juice and water. Bring to a boil and skim off any foam. Reduce heat to a simmer and add all the medicinal herbs and 1 1/2 teaspoons of salt (or to taste). Gently simmer for 40-45 minutes, or to desired strength of the soup and tenderness of the chicken. Serve hot and garnish with sliced scallions. If you cannot find cornish hens, you can also use regular chicken or chicken parts with bones. The longer you simmer, the darker the soup will be and the medicinal herbal flavors will also be stronger. You may want to taste the soup throughout the cooking process and stop when you're happy with the flavors. You can eat the soup on its own, with rice or with noodles. Hi Sophie! I have never heard of this recipe before so I asked my mum about it today. She said that my grandpa had it a lot when he got sick and she used to skim a bit for herself! So bad. As you pointed out in your post, traditionally a black / silkie chicken was used for this recipe. I didn’t even know they existed!!! Learnt something today. Thanks for the post! Hi Scruff! Thanks for leaving me a comment! My mom often made this dish for me when I was sick or when she thought I needed some extra energy :D. There are also many Vietnamese dishes I have never tried yet. Glad you found my post useful :)!